Practically all communications technologies depend on fiber optics, making this the most important technology for communications professionals to understand. VDV Works has created many programs for fiber optic training that are now available through the FOA, including the free online training at Fiber U. The VDV Academy training curriculum is developed by Jim and Karen Hayes, founders of Fotec, the fiber optic test equipment company they sold to Fluke Networks in 2001, and the "Fiber U," "Wire U" and "Cable U" training programs, including the famous "Fiber U" conferences of the 1990s and the first online "Fiber U" training developed in 1997. The Fiber U and Cable U websites were the place many techs got their start in cabling. Jim is author of The Fiber Optic Technicians Manual and Data, Voice and Video Cabling, the four FOA reference guides and monthly columns in several magazines including Electrical Contractor. Karen is the originator of "Lennie Lightwave's Guide To Fiber Optics" and "Uncle Ted's Guide to VDV Cabling," the highly-praised free online guides to cabling. Together they have trained over 10,000 cabling professionals and hundreds of instructors, written a half-dozen textbooks and hundreds of industry white papers, magazine articles and web pages. If you are an instructor who wants to teach a VDV class, VDV Academy has created programs that are available through the FOA to FOA approved schools, affiliates and corporate members. Instructor programs require tools, test equipment and supplies which are available at a discount through Advanced Fiber Solutions. If you have a group interested in a seminar or training class, we can have an instructor come to your location anywhere in the world and present a custom class for your company or organization. We specialize in industry overviews and advanced topics - fiber optic markets, applications, testing, the metrology of testing, OTDRs, fiber characterization, etc. 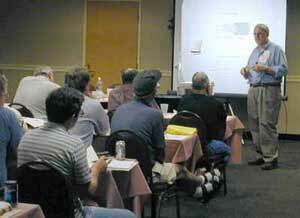 VDV Works created two free online tutorials for those getting started in fiber optics or structured cabling. These websites have been used by more techs to get started than any other website or publication because they are the best overviews of the technologies available anywhere - and there's no product sales pitches! 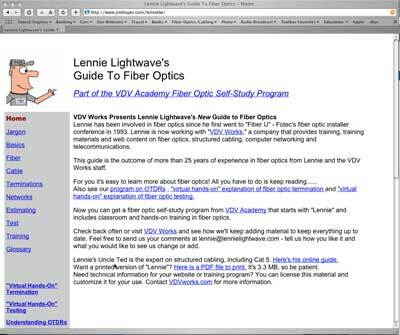 Lennie Lightwave's Guide - where many fiber optic techs got started! 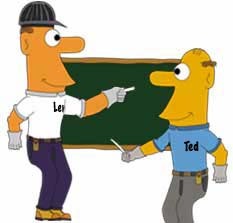 Lennie and Ted iBooks are now available free for the iPad from iTunes Store. These programs are also available free from FOA's Fiber U website. VDV Academy is the educational division of VDV Works which provides technical support to the voice, data and video industry through consulting in technology and marketing and developing technical content for websites and training programs.